The last time Ms. Angelica Aros was at Pueblo, as a high school senior in the 1999-2000 school year, PHS still had pay phones around campus; 18 years ago, students—and much of the world—did not know what cell phones were. People were still “paging” on their “beepers”, she recalled. 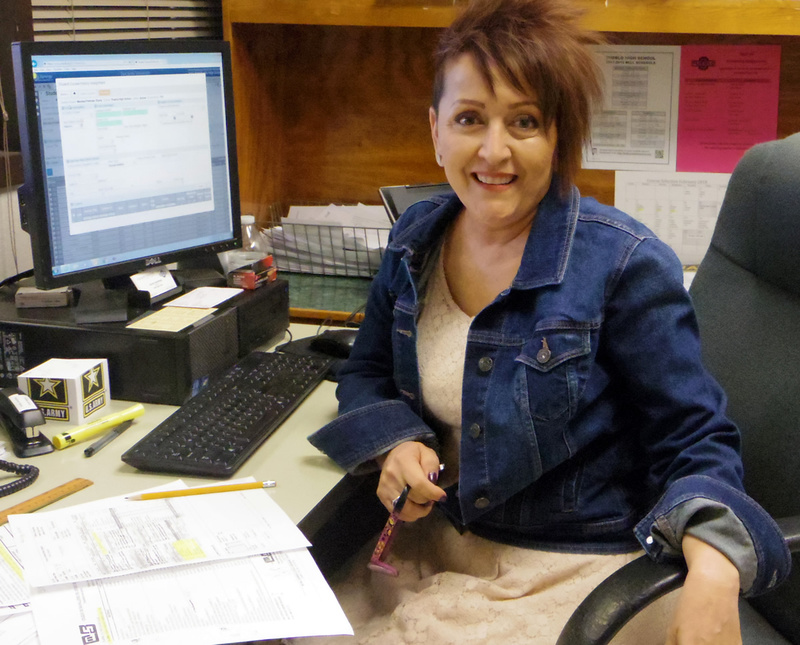 Aros is Pueblo’s newest attendance clerk—filling in for Ms. Rosalie Sinteral, who retired in December. But, she is not new to working in T.U.S.D. Prior to returning to Pueblo, Aros worked at Pistor Middle School for seven years; then, she moved to Hohokam Middle School until the facility closed, at which time she transitioned to Tucson High Magnet School, where she remained for nearly four years. Following graduation from Pueblo High School in the spring of 2000, Aros (whose maiden name was Miranda) attended Pima Community College with a soccer scholarship. She added that although she loves her job, sometimes she chuckles at some of the excuses parents give for their children being absent or tardy. Except for the pay phones being removed from campus, Aros said that Pueblo “pretty much looks the same” as it did back in 2000. “It’s good to be back,” she said. Imelda Cortez (Black Shirt) helping Aurora Montoya. Former Pueblo student Ms. Imelda G. Cortez has returned to Pueblo to teach junior and senior English. As a 2009 high school graduate, Cortez began her collegiate career at the University of Arizona where she earned her bachelor’s degree in Mexican-American studies; later, she earned a Master’s degree in higher education. Cortez explained that she decided to become a teacher while attending middle school. After attending Pueblo and graduating eight years ago in 2009, she definitely knew that she wanted to become a Warrior alumni. 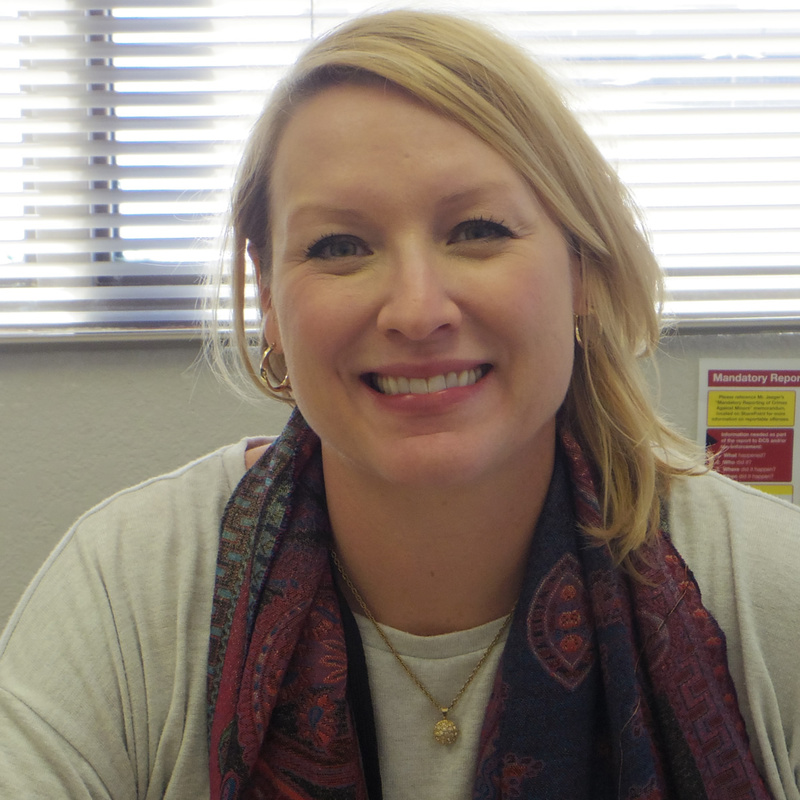 She added that she hopes that all of her students will pass her class and earn their language arts credits in order to graduate from high school. 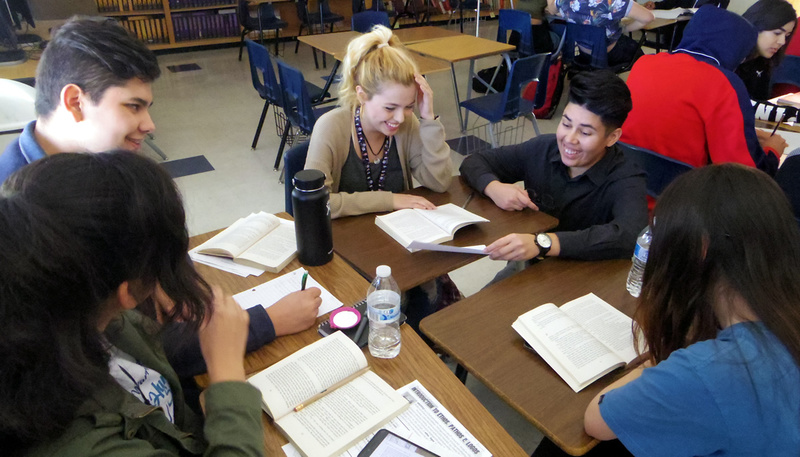 “I have to admit that I truly like all of my students this school year, and I can honestly say that I don’t have one bad class,” Cortez said. This doesn’t mean that Cortez doesn’t have her fair share of teacher challenges. She added that she has also learned that that treating students with dignity and respect is key to having a good relationship with them. Cortez also helps out with the “IAMME” Club—providing support and resources for what the students want to do for the club and school. After the sudden retirement of registrar Ms. Marina Ordoñez last summer, a new Warrior comes to the rescue to fill that position: Ms. Rachel Apalategui—who actually knew Ordoñez for many years prior to coming to Pueblo. Apalategui is no stranger to Tucson Unified School District. She has worked at multiple schools, including Grijalva Elementary School, Pistor Middle School, Tucson High Magnet School and now at Pueblo. Coming to Pueblo has been somewhat of a bittersweet transition, Apalategui admitted. She spent 14 years at Tucson High, which she said kept her “grounded”. To be a high school registrar requires a great deal of communication and diplomacy, Apalategui explained. For example, this spring, she has to ensure that seniors have sufficient credits to graduate, and that can be very frustrating. She added that she has to have a frequent dialogue with counselors to make sure every senior is on track to graduate—and how to help every senior graduate in May. Although her office walls are a bit bare, they won’t be for long, Apalategui insisted. “Pueblo is home now,” she said. New this school year to the administrative family at Pueblo High School is former English teacher Ms. Kathryn Gunnels, who officially begins as assistant principal with a long list of responsibilities, including the planning of meetings for teachers (Professional Learning Communities), supervising advanced learning opportunities, finalizing the master schedule and organizing student-testing events. She also communicates to staff via a weekly update on teachers’ computer work stations. Gunnels, who taught English for 10 years at Pueblo (in two separate time periods), actually fulfilled her student-teaching assignment under the supervision of Mr. Manny Galvan, who retired a few years ago (but occasionally substitute-teaches) and Ms. Marci Bowman, who also retired from teaching. She revealed that education was not her first career choice. 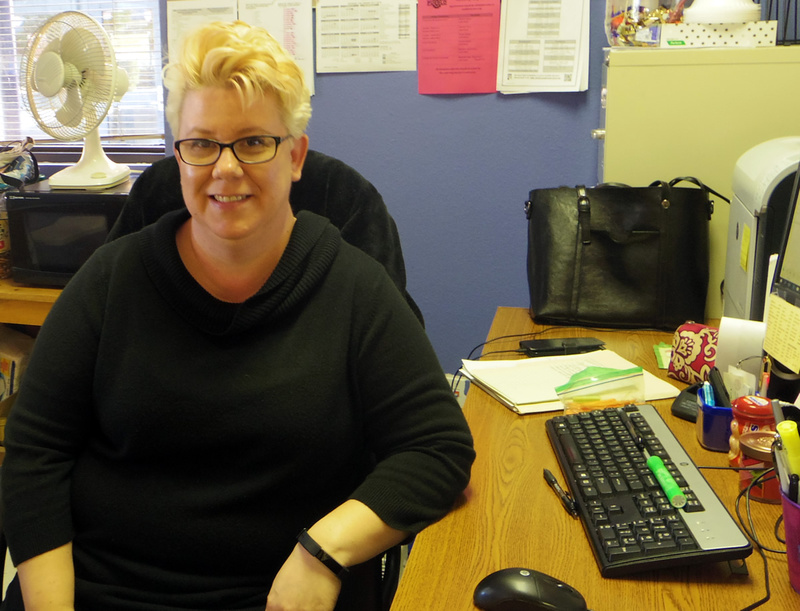 Gunnels said that she majored in business, but after mentoring at the Arizona School for the Deaf and Blind, she was inspired to become an educator. Husband Mr. Michael Gunnels is a communications media tech teacher; son Jeren is a transition school-to-work instructional specialist; and other son, Derek, is an exceptional education teacher. Hiking Club: Mount Everest Is The Limit! Pueblo’s Hiking Club, sponsored by Mr. Ernesto Somoza, is off and running to new heights this year, as a record number of Warriors have joined—a total of approximately 50!—including about 10 adults, which include several teachers. Last school year, 13 Hiking Club students participated in a Grand Canyon experience during spring break, which may have contributed to the high number of students joining this year, Somoza said. The trip was “very successful” and seemed to be an impetus for students wanting to join this school year. Somoza plans to repeat this trip during spring break this March—due in part to the success of the club’s tax credit drive which raised more than $1,250. He added that he would love to take students to out-of-state hikes, including Yosemite in Central California and Arches National Park in Southern Utah—among other places. The more tax credit donations that the club receives, the more trips the club can partake in during the school year. He added that only 10 students are able to participate in the Grand Canyon trip, and this participation is based on students’ generous tax dollars they donate to the club as well as their activeness in the club throughout the school year. Mr. Ernesto Somoza (Left) with his sister Melissa Somoza at Humphrey’s Peak, the highest natural point in Arizona at 12,633 feet! “The club has an excellent variety of students this year,” Somoza said. “They come with a variety of skill levels and with an enthusiasm to spend time in the outdoors.”Meetings take place in Mr. Somoza’s classroom (T-12) after school on the first Tuesday of each month. Club President Anette Durazo ensures that the club stay organized and helps approve hiking trips. She added that the club’s next trip is scheduled for Feb. 10 to Colossal Caves, just east of Tucson. The club was founded in ­­­­the fall of 2015, Somoza’s first full school year. 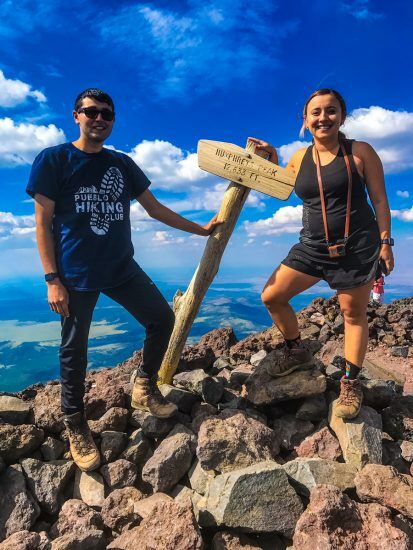 The inception of the Hiking Club was the result of a conversation that Somoza had with (then) Assistant Principal Alma Carmona while attending a conference in Colorado. Somoza was talking to her about how he wanted to become more involved outside of the classroom. As a result of his over-zealous spirit, Carmona encouraged Somoza to become a Class of 2019 sponsor as well as the advisor of the newly-found Hiking Club. “I hiked a lot during my college years, and I wanted students to experience what I enjoyed so much,” Somoza said. 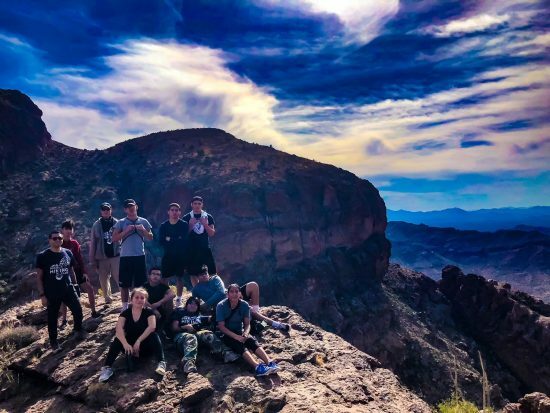 He added that besides the Grand Canyon trip, Hiking Club members can expect other adventurous moments this semester—including the trip to Sedona and other small trips around the Tucson area. Posted on January 23, 2018 Categories Club Events, Clubs, Meet The StaffLeave a comment on Hiking Club: Mount Everest Is The Limit!